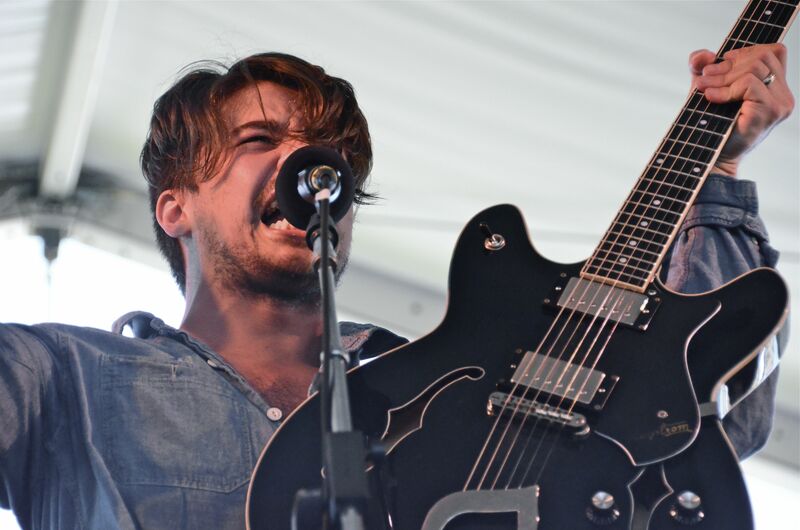 Day One of the Newport Folk Festival felt like (and was) history in the making. It was hot…in so many ways. We kicked off the day with Staten Island’s PS22 Chorus, who you might remember seeing at the Oscars with Lady Gaga. The stage was packed, as was the audience. The confidence of the kids and the devotion and passion of their teacher was pretty overwhelming. I got the chance to meet teacher Gregg Breinberg afterward and he was as genuine as it gets. Two of my top three performances were happening at the same time. TYPHOON and River City Extension both had amazing stage presence and drew heavy, energetic crowds. And then there were the whales. The Walin’ Jennys and their minimalist sound quieted thousands watching at the Fort Stage, while the Freelance Whales closed their set of electronic folk with a hipster dance party. But only Delta Spirit had the crowd standing the entire time. People were dancing for the entire set, though also heavily encouraged to do so by front man Matt Vasquez. Earl Scruggs, who perfected banjo picking as we know it today while in Bill Monroe’s Blue Grass Boys, made it to the stage at the age of 87. I’m not sure he’s picking as fast as he used to, but his presence was a force. Old-time band leader Pokey LaFarge interrupted his set to ask the crowd why they were missing Scruggs and were anxious to wrap things up so they could get over to see Scruggs. Gillian Welch and David Rawlings stole the show as usual with an amazing set. Sara Watkins, who is currently touring with The Decemberists, joined them on stage for “Go To Sleep You Little Baby.” Meanwhile, gospel great Mavis Staples turned the covered Quad stage in a big tent revival and blessed the crowd with a sit-in from Colin Meloy of The Decemberists. Whenever Pete Seeger showed up, I got chills. From what I saw, he joined The Song Circle where he played a few solo numbers, following Dar Williams who blew me away. He also joined fellow Greenwich Village 60’s folkster Ramblin’ Jack Elliott, as you would expect, but then also hopped on stage with his banjo to backup The Decemberists. Check out some photos of the day below from Team grass clippings. About to hop in the car for Day Two. You can listen on NPR Music. Stay tuned for more. Ahhhhhhh!!! I want a chance to live that day!! !